So, I press on. Another unpopular dish that looked so good online. I think if it looks too good to be true (only 7 ingredients to a quick, yummy dinner), it is too good to be true. It was edible but not flavorful. As I said above, it was bland. This meal reminded me that there are no short cuts in this world. You can take some but you will settle for bland. You deserve better than bland. God has great plans for all of us. Even those who don’t yet know him. I don’t want bland in my life. There are days I want to take the short cuts but know that later I will regret it. I don’t regret trying this dish because it reminds me that a) most recipes that promote quick and yummy, aren’t, and b) stop trying Better Homes and Garden main dish recipes. Their desserts and sides are good but rarely the main dishes. So my take away this week, keep trying. If it looks too good to be true, it is. Take the time to prepare a good meal at least once a week because short cuts every day is mediocre food every day. On a positive note, my kids ate it. They didn’t complain. They are allowed to give honest feedback on nights I make new dishes. Other nights, they are to find something positive to say whether they like it or not. We all agreed it was bland but edible. I truly was impressed they ate it. We all agreed the pecans were the best part. I will search for another pecan dish that hopefully will WOW us. Directions:Trim fat from chops. Sprinkle chops with salt and pepper; set aside. In a large skillet melt butter over medium heat until it sizzles. Add apple; cook and stir for 2 minutes. Push apple to sides of skillet. Add chops; cook for 4 minutes. Turn chops, moving apple aside as needed. Spoon apple slices over chops. Sprinkle with pecans and brown sugar. Cook, covered, for 2 to 4 minutes more or until an instant-read thermometer inserted in center of chops registers 145 degrees F. Serve chops with apple slices and cooking juices. This is by far my favorite dish I have made. Those cheesy potatoes were good but this one was great. My kids ate their entire dinner including the cucumber salad. 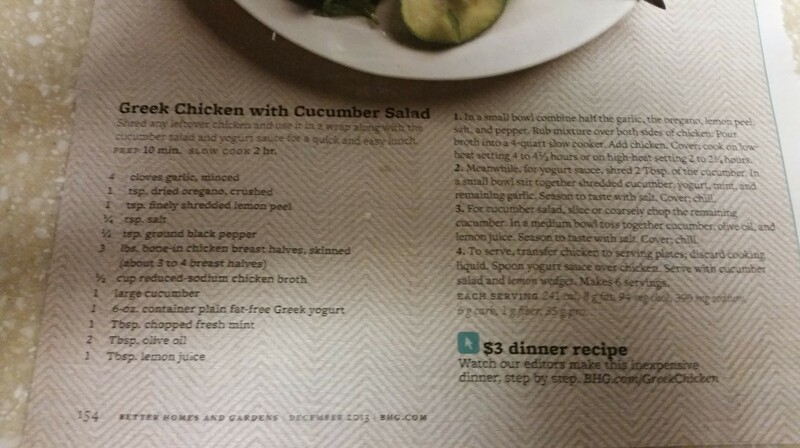 Well, one kid only ate the minimum required cucumber but the other two had seconds. This dish was easy to make. Since the two sides are prepared in advance, getting dinner on the table took no time at all. So fast, that once again I forgot to take a picture. I did vary the recipe a bit. I didn’t use bone-in chicken. I recommend if you plan to make this in the crock pot, as the recipe suggests, use bone-in chicken. Boneless chicken breast tend to turn out a bit dry in the crock pot. Next time I will still use boneless chicken breasts but will bake the chicken instead. The chicken rub made the house smell amazing. I must confess, I do not like Greek yogurt. I know that I am breaking social taboo by admitting that the hottest craze in yogurt is not appealing to my palate. We tried flavored Greek yogurt for a month. The girls gave up on it quickly. My son and I tried but finally agreed, Yoplait is so much better. I was skeptical to make a sauce that had Greek yogurt as the main ingredient. However, the cucumber, lemon, mint, and garlic made it wonderful. Next time I will double the sauce recipe. We ate 90% of it. So Greek yogurt is welcomed again in our home – just not for breakfast. Also, I would recommend using any leftover chicken (we had maybe a 1/4 breast left), and mix with the sauce to make a chicken salad. It is fabulous cold. I think I will make this recipe in the morning and serve it cold for dinner. Especially with our current heat wave, a cold dinner would be welcomed. Pita bread, hummus, cucumber salad, and Greek chicken salad. Yummy. As you can tell, I highly recommend this dish. Dig in and enjoy. Send me feedback after you make it. This week reminded me of how much I love Greek food. The flavors are mouth-watering. My children love it too. It is a healthier style of cooking by using fresh and flavorful ingredients. I think I need to add a Greek night to our week. Hummus is often the kids snack after school. Having pita bread in the house has been good too. We love cucumber, cream cheese, and dill sandwiches (tea sandwich style). I realize cucumber is used in so many Greek dishes. A perfect compliment for this warm weather we find ourselves in. The best part of learning how to make this style of food at home is that Greek food can be so expensive. Cafe X20 in Monrovia is a tasty place for Greek food. The only drawback is that it is a hookah bar too. (Please read that carefully.) I don’t like my kids in there when people are smoking it. However, at lunchtime there is barely anyone there who does that. I can imagine dinner would be a different story. Anyway, try some good food there then go home and make it yourself. I need to search for a good marinade for chicken to make kabobs. I have a wonderful Tahini sauce recipe I made last summer. At least I can honestly say the phrase “it’s all Greek to me” doesn’t apply here. I can actually create some tasty Greek treats. Baklava will be featured one of these weeks. Yummy. 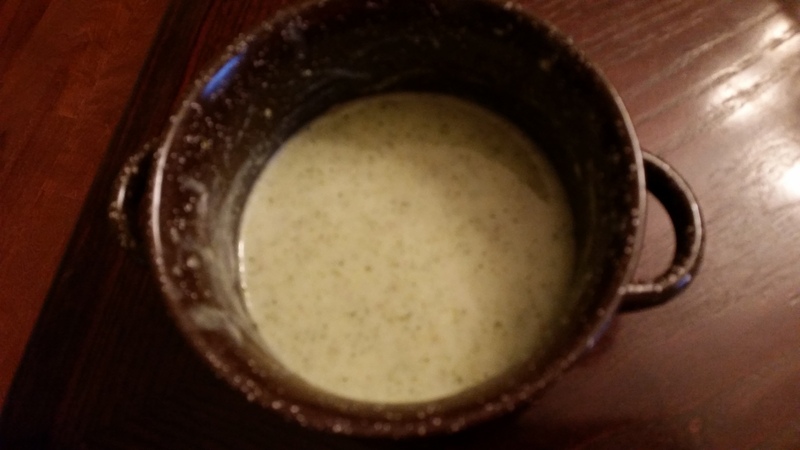 The week flew by while the ingredients for cream of broccoli soup sat in my refrigerator. I knew I would make it but wasn’t sure when. Saturday, the hottest day of the week, we had soup for dinner. I made homemade bread in my bread maker. Remember the bread maker? Do you still have yours? I got it as a wedding present. I used it a lot years ago. Now I just use it for holidays. It still makes yummy bread. After sitting outside in the sun for 2 hours at a baseball game, I made soup. I altered the recipe a bit. I prefer to make it as is the first time but I couldn’t this time. I don’t enjoy vegetable broth so I used chicken broth for more flavor. Also, the garnish on the soup (the white and yellow circles on the main picture) I skipped. I didn’t want to make ground almonds and saffron was $20. Garnish was ignored. The other deviation from the main recipe is that I didn’t pour it into a blender or food processor. I have a hand blender that is for mixing soups in the pot. I used that to puree it. This is my bowl of soup. The soup wasn’t hard to make and I found it very tasty. My husband and I enjoyed it. The kids endured it. It is a strong broccoli flavor. You definitely need to add salt and pepper. I think the chicken broth added to the richness of the flavor. I recommend it. You will probably have to force it on your kids though. I allowed them to add cheese to it. The cheese helped them finish their tiny portion. My thought for the week is about cooking what I like to eat. I often cook for my kids palate. This was a dish I figured they wouldn’t love but I would. I wasn’t offended when they added some other food to their dinner plate. I required them to finish the soup I gave them – it was their veggie for the meal. Adding cheese or a sauce to a dish they don’t find appetizing, works for me. They are trying something new and I am enjoying my food. I encourage you to find a recipe that sounds yummy to you. Don’t worry if the rest of your family will like it or not. It’s one dish, one night, they will survive. I love soup and broccoli. This was a win win for me. This won’t be a regular staple on our table but I will make it from time to time. I cut corners this week. I knew it was yet another busy week so I went for an easy recipe – a dump cake. My sister gave me the Dump Cake cookbook and the Dump Dinner cookbook. The concept is: you dump all the ingredients in one pan and bake it. 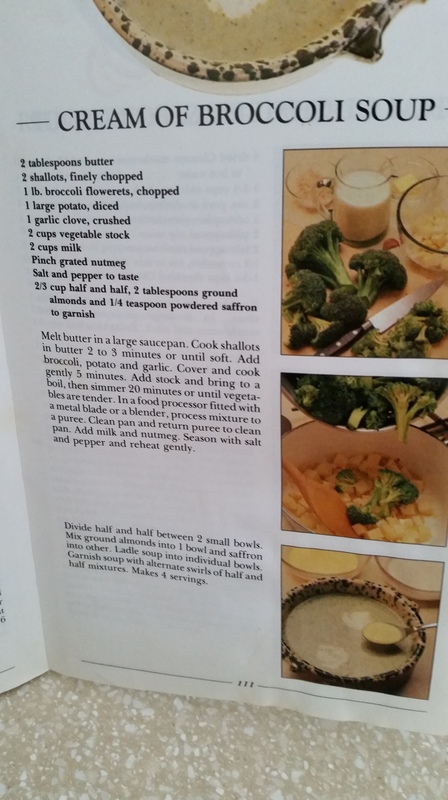 Other than opening cans, the only “difficult” part of this recipe was melting the butter. I dumped four cans of fruit in a prebuttered 9×13 pan. I sprinkled cinnamon and nutmug over that. (I would mix the two before sprinking next time though.) I dumped the cake mix. I poured the butter. I sprinkled more seasoning then I put it in the oven. One hour later, bubbly, yummy, gooey cake. Good but not rocket science. I once again forgot to take a picture. Some weeks it is OK to choose the easy road. We need a break from tasks or routines. When we know it’s coming, we can plan ahead. When it sneaks up on it, we hunker down and deal with it. I will say though, I felt guilty making a dump cake. I felt as if I were cheating you out of a decent recipe. I cheated myself out of a joyful moment of cooking. I cheated my kids out of any nutrition. (I don’t feel too guilty about that because we all love a good dessert.) I cheated myself out of an opportunity to grow this week. I chose the easy road. Honestly, I had time to make at least a new appetizer or even a more complicated dessert. I didn’t want to. I chose not to try. Adapting to the fast balls life throws at us, is part of life and part of growing. I regret not rising to the occasion. I chose the easy path. I should have chosen the path of growth. Would my week have been a bit crazier – yep. Would my life have been richer for chosing a bit of a challenge – you bet. Hindsight is 20/20 they say. Reality is, I knew exactly what I was doing before I reflected on the week. 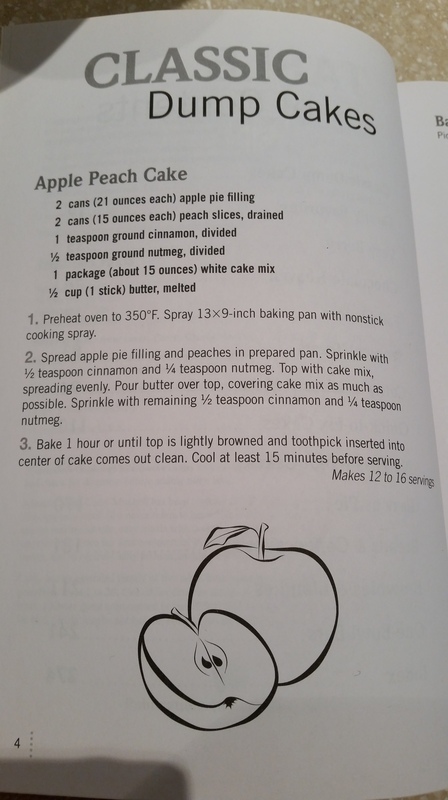 I felt guilty buying the cans of apple pie filling and peaches. I knew I was cheating myself out of an opportunity to grow. I chose the easy path anyway. This week I encourage you to challenge yourself. If you see two paths, don’t chose the easy one every time. Try something new. I don’t plan to make stuffed chicken with special sauce next week but I do plan to do more than open a can and a box. God doesn’t want me to coast and take the easy paths. He does desire for me to grow and experience more. When I feel overwhelmed, He wants me to rest in Him and let Him carry the load with me. This week, I will share my load rather than avoid it. I hope you do the same.